It’s like being bored on your honeymoon. Or not feeling excitement when you get the keys to your new house. Starting a new job is one of life’s milestones. It’s something you have high hopes for, and you are desperate for them to be realised. If you’re bored within those first few weeks, it’s hard to get excited about the future. And I don’t mean being a bit bored from time to time. Let’s be honest, it takes a special type of person to have fun learning the new expense system. And this is a job after all, not a trip to Disneyland. No, I’m talking about deep routed boredom. The type that sets in and shows no signs of lifting. 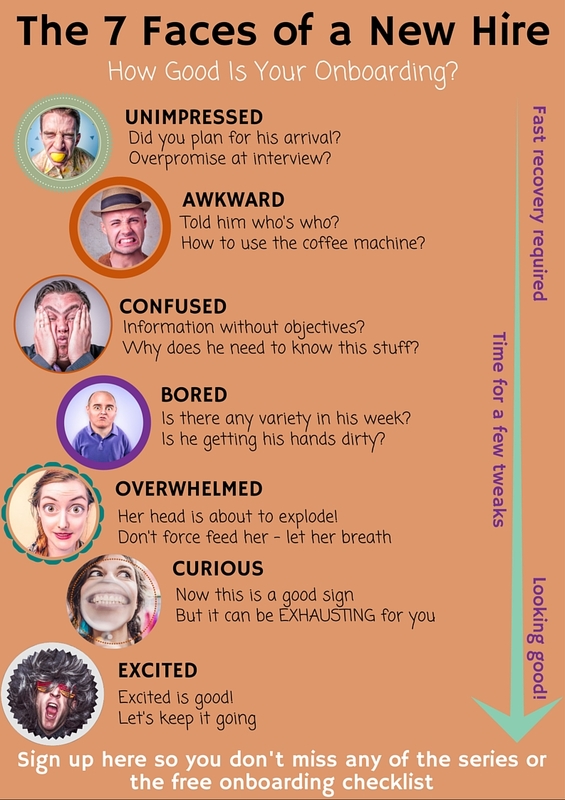 If you look across the office and see your new hire looking numb with boredom, you need to act fast. So what went wrong? Why does your new hire, who looked really up for it on their first day, now appear to have boredom oozing out of every pore? 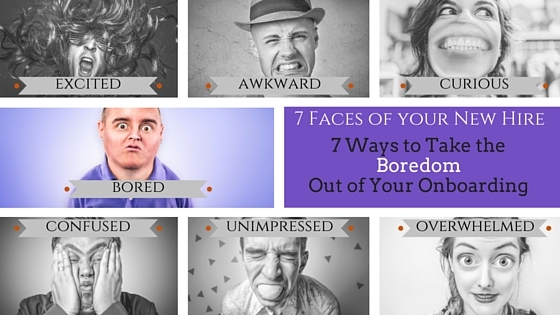 In this fourth part of the ‘7 Faces of Your New Hire’ series, we look at how to banish the boredom from onboarding. He is getting up to speed with his new job. But how is he doing it? In an ideal situation, you would have a group of new hires all starting at the same time. You can run a big training class and they have an instant group of buddies. Bingo! Unfortunately, for most companies, things don’t work out like that every time. If your intake is coming in sporadically, it is hard to justify a training class. So out goes the real life trainer, in comes the login and password to the eLearning portal. Now, the advent of elearning has been transformational. The trouble is it doesn’t feel very transformational when that is all you are doing. Just you, a screen and a pair of headphones. For days on end. Not only is it boring, it probably highly ineffective too. How much of that information is he really taking in? And, of course, there are some things your new hire will need to know, that you don’t have an elearning module for. So he has been sitting next to Simon for the last week, learning what he does. Unless they really hit it off, it can be hard work for both parties to be so closely entwined for so long. Try and find ways to break up the days. A good way to approach onboarding is to write a list of everything you want your new hire to do over the first few weeks. Everything from meeting Jan from Marketing to doing his Information Security training. Get yourself some post it notes and put one activity on each post it note. On the office wall, make virtual columns with your post it notes for each day. Make sure that there is some variety in each day, or at least within the week. You should be aiming for a blend of learning, doing and human interaction. If you can, structure your training in bite size chunks, so he can try it out for real before moving on to the next part. As a young graduate trainee, I remember sitting through two full days of detailed training on the insurance product the company sold. It was completely irrelevant to what I was doing in my job, and the level of detail was overkill. I was bored to a whole new level of boredom. The intention was to give us an introduction to what the insurance part of the business did. A quick overview and a sheet of FAQs would have been perfect, thanks very much. I am a big fan of introducing your new hire to what else is going on in the company. But make sure it is at a relevant level to what he needs. He has left a job where he was busy. Contributing. Doing stuff. Now he is just listening and learning. It feels so sedentary. Find him something he can get involved in. Make him feel like he is adding value. Give him some real purpose in his day. Some things are just a bit dull and there is no getting round it. But if he knows he will be getting involved in some interesting tasks once this part is done, he is more likely to grit his teeth and get on with it. Of course your new employee has to understand the job they have been hired to do. But make sure he understands why he is doing it, as well as the how to do it. Giving him a clear picture of where he features in the story that makes up the success of your business. To keep the boredom out of those first few weeks, you need to have a plan. It is hard work onboarding the new guy. You have your job to do, and when you are busy you can miss the tell tale signs that things are not going so well. Mix up learning and doing to make him feel he is adding value. At the end of this seven part series, I will be publishing a guide to creating an awesome onboarding plan. Click here if you would like it sent straight to your inbox.